Is a vision on the work of some of the artists that we consider most relevant in the interna- tional audiovisual scene. Artists who tell us, via interviews, about their approach and understanding of the work of a “Visualist”. The documentary gets us closer to the work of visual artist, their influences, methods, ideas and evolution. From before the birth of cinematography to the digital era, visual art has branched into many different disciplines, such as Audiovi- sual Performance, Live Cinema, Videojock- ey, AV Set or Videomapping.  In VISUALIST we talk with many of the biggest creators behind these terms, and though their statements we seek to divulge and promote the development of these forms of digital art, showing the work of all these artists. In this documentary we show the viewer who is behind those incredible jaw-drop- ping shows, who is behind a video installa- tion or who creates those supercool videos we see on many events and concerts. We want to show to the public the work of a whole generation of artists who usually dwell in the shadows, pulling the strings.